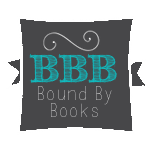 Bound By Books Book Review: Welcome!!! Welcome to my blog! Super excited to share my love of books with you. I will be adding to this page so keep checking back. Thank you for join me on my blogging journey, I excited to share this with you and it means a lot to me.